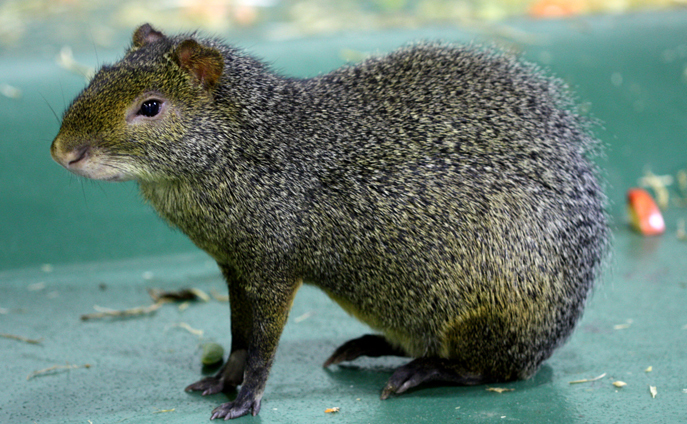 The red-rumped agouti is a rodent with teeth strong enough to crack open a Brazil nut. When food is plentiful they bury it in caches to eat when food is scarce, making them important for seed dispersal in the forest. Agoutis mate for life. Their young are born fully developed and are able to run within hours after birth. Agoutis can jump as high as 1.8 m (6 ft) from a sitting position, enabling them to evade predators such as coatimundis and ocelots.